Just like that, New York Fashion Week has come and gone. Instead of rushing on to absorb even more newness coming down the London runways as we speak, we wanted to take the time to dissect the NYFW F/W 19 trends that already have the sartorial crowd talking. Absorbing so many new collections at one time can be overwhelming, which is why we broke down NYFW for you into the 10 trends you need to know. So far, this season is full of fresh color palettes, exciting accessories, and clothes that are (drumroll, please) actually wearable. Quirky updates were added into the tried-and-true fall/winter rotation such as colored tights, furry hats, and more. Ahead, read our take on the NYFW F/W 19 trends that are already burning up in our hearts and our wallets. 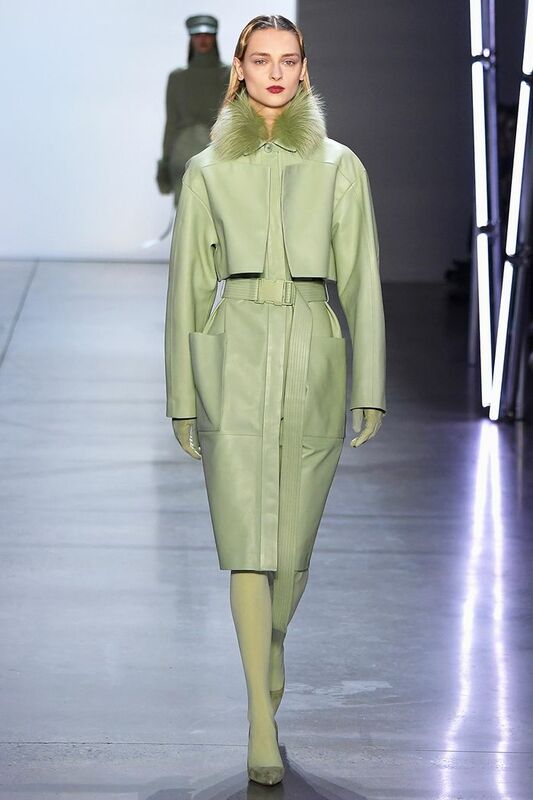 While there were many color trends that swept the F/W 19 runways, this pistachio shade was the freshest. Ranging in hues from dark to light, this color is one we suggest adding to your wardrobe immediately. The print that once felt tired is officially making a comeback as cool, newer brands like Area and Gypsy Sport gave the classic print a full makeover. Furry accessories dominated the NYFW runways, but it was these statement fuzzy hats that won our hearts. Paired with a slinky suit or floral dress, this new accessory trend is one that will transform your autumn look for the better. New York's most beloved designers took the quilting trend and turned it upside down, introducing it in new colorways and styles including these pastel quilted Rachel Comey pants we can't stop thinking about. This fall, when you don't know what to wear, match your tights to your shoes and call it a day. Thinking of a collection from NYFW that didn't display tights of some kind is near impossible, but this particular styling won our hearts. Sweaters on sweaters—when it comes to staying warm this fall, layering up on all of your knitwear is the way to go. Use a sweater as a scarf, match your scarf to your sweater, and so on and so forth. As long as you're dripping in these cozy confections, you'll be right on trend. Designers took feathers to new heights this season, as Marc Jacobs, Michael Kors, and Dion Lee displayed the festive adornment in ways that felt new and exciting. Of course, this mystical Marc Jacobs number took the lot. Patchwork that doesn't feel too bohemian is finally here. The mix of spliced prints on everything from jackets to dresses was styled in ways that felt polished amid their otherwise undone nature. We wanted to call out suiting as a trend, but at this point, it's a lifestyle. Instead, we're focusing on the styling of said suits that the F/W runways put forth, and belting was by far a crowd favorite. This season, there were handfuls of looks that had us feeling like we had just stepped foot into a period film. Thanks to Brock Collection (no surprise there) and Ulla Johnson, we're seeing a fresh spin on prairie dressing—a little more refined and a little more elegant. It's about time, right? Next up, shop the 25 shoes every insider will wear this year.